Anne Faber began her journey in food journalism when, during her time at City, she took an internship at ITV's Saturday Cooks. After graduating she worked at Associated Press for over two years before she decided to pursue her real passion: food journalism. On her internship experience, she comments: "City was a great stepping stone. The internship gave me a real insight into the industry and also got me my first job. It was the perfect placement! 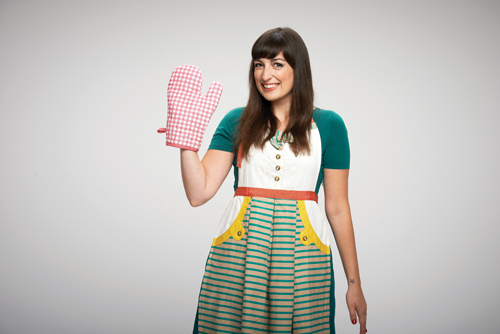 Who could have known that, five years later, I'd have my own cooking show?" Anne became a regular freelancer for Time Out's Food & Drink section, worked for German television channels and has been writing her food blog "Anne's Kitchen" since 2010. In 2012 she was commissioned to write a cookery book and she also pitched an accompanying television programme to a broadcaster in Luxembourg. In 2013 the channel commissioned her show for two years and Anne's ultimate dream is for the show to be adapted and broadcast to German television audiences. Commenting on what she loves about her job, Anne says: "I love waking up every day and knowing that whatever I'm doing, I'm doing it for myself. I really enjoy the full spectrum of the creative process, from coming up with recipes to cooking, styling and photographing the final dish and writing little stories to accompany my recipes." Find out more about the Department of Journalism at City, University of London.